When I was in Bologna, I met Judy. Judy introduced me to the idea of writing down the list of things I wanted to accomplish, to help make it real. I had such a list when I was 14. I’ve since seen the majesty of the Himalaya (that one took 22 years to become reality), scored a goal at Scarborough FC’s now defunct McCain Stadium, and dated a tall, dark and handsome guy. I think I must’ve been sniffing school marker pens when I wrote I wanted to compete in the London marathon. Still, 9 out of 10 achieved must mean the hypothesis of this entirely unscientific experiment with a sample of 2 (me, Judy) must be true. Writing stuff down helps make it happen. Not least because you’re less likely to forget it. 1. Live in another city or country for at least 2 months – rent a place, shop where the locals shop, absorb the culture, speak – or try to speak – the language. What I’ve done: I’m currently (December 2017) in Oaxaca, Mexico for three-and-a-half weeks. Half (ish) way there! What I’ve done. I kinda did this in Guatemala in 2013, but it was so cloudy I couldn’t see my hand in front of my face, never mind that I was on a volcano. So I decided it didn’t count, and I’ll be volcano-climbing in Nicaragua in January 2015 instead. Yay! 3. Take the train over the Copper Canyon, Mexico. What I’ve done: Finally ticked this one off in October 2016, and it was worth every penny! All aboard the Copper Canyon Railway! 4. Drink a cosmopolitan in a fancy New York bar. I’m good at drinking cocktails. I just need to move the venue from York to New York. Update November 2016: In light of the US election result, I’ve decided not to undertake any personal travel to the USA for (at least) the next four years. Update December 2017: Nope, still not going! What I’ve done: My Spanish improvement was slow, but went up a notch in early 2015 when I went to language school in Nicaragua! In late 2016 I took some private Spanish lessons, which ended when my teacher moved back to Spain – boo! However, I’m now (December 2017) in Oaxaca, Mexico, enrolled again in Spanish language school for two more weeks – hurrah! 6. Read a book by Hemingway. Cos I feel as though I should. What I’ve done: The Florida Keys were an awesome place to fulfil this one in January 2015! What I’ve done: Back in March 2015. I got some tips from a photographer guru and put ’em into practice. Since then, I’ve been lucky enough to go to Iguazú Falls in Argentina on honeymoon in March this year, and now also own some filters. Sorted! 9. Fall in love … with someone who loves me too. All together now, aaaaahhhhhh! Just Married! We had a quick photo stop after our wedding outside York Minster. What I’ve done: Er, yeah, not even looked at this one! What I’ve done: Ok, this one’s frustrating the hell out of me. After joining the almost-as-cheap-as-chips gym near my house and managing to speed up by a few minutes, I entered a 10k in August 2015, in part inspired by Sir Ranulph Fiennes! My racetime was 55:21 – a race PB but 21 seconds short of my target. Since then, I’ve consistently managed to do training runs around the 54 minute mark, but race times of 56 minutes. Grrrr. What I’ve done: My yoga practice has been patchy, to say the least. I have gone to the occasional class, but occasional is the operative word. Best have a word with myself. 14. Design and sell something artsy. What I’ve done: Yeah, not done that. Yet. 16. Do cool textiles things in Oaxaca, Mexico. Cos I love Oaxaca. And all things Mexico. And textiles. What I’ve done: Well, I’m in Oaxaca at the moment (December 2017), so that’s a good start! I’m doing a very good job at window-shopping for cool textiles … but this trip’s all about the Spanish. What I’ve done: I set up my Limited Company, specialising in marketing and communications, back in June 2015, and interesting work is still coming in. I also have some cool business plans to develop in the early part of 2018. What I’ve done: Got an idea, learnt from an author at a book-publishing talk. Not much else. 19. Get a travel / travel-related article published in a national magazine or newspaper. What I’ve done: Hmmmm, this one’s not a priority at the moment – one to revisit in the future. What I’ve done: Errr, compiled a reader offer page and included affiliate links (where I get a small commission) in some of my posts. If you want to use them, that would be awesome! I have a few other irons in the fire too – linked to #17 and my business. 21. Have the courage to follow and act on my gut feel earlier and not succumb to some British “being polite and nice” thing I seem to do, even when there’s no need. This doesn’t mean be rude to people, rather that I don’t have to extend the hand of friendship to people whose actions deserve only civility. Bologna – it’s inspirational just to look at it! 22. See the sun rise over Bagan, Myanmar. What I’ve done: The current treatment of the Rohingya population in Myanmar means this one’s on hold. 23. Volunteer abroad for at least a month, in a capacity-building role (not “voluntourism”). What I’ve done: Since November 2015 I’ve been mentoring young people volunteering in Zambia and Uganda in all things business and marketing, via the Challenges Worldwide ICS programme. I’ve also started volunteering on a local community project in York this year (2017). 24. For my Cambodian sponsored child to fulfil his dream of becoming a policeman. What I’ve done: In September 2015 I learnt that my sponsored child’s family had moved away from the area – I suspect for economic reasons, so I will never know if this one comes to pass. Since then I’ve been sponsoring a little girl in Bolivia. 25. For my mum and dad to go abroad. Neither of them have ever left UK shores. Getting them passports will be a challenge, getting them on a plane nigh-on impossible. I’m thinking Eurostar. Maybe Bruges? What I’ve done: In hindsight, I’m thinking this “must-do” is more about me than it is about my parents. Mum, frankly, isn’t interested; and I’m not convinced Dad is anymore, either. I’ll play it by ear! So, there you have it … some progress made in 2017! These experiences have already made my life richer, and I hope some of them have made – or will make – others’ lives even just a teensy bit richer too. What experiences have been your most memorable? Have you accomplished something you’d previously put in writing? Will you make your own list? Share your ideas and thoughts below. Yup, it’s that time of year again … where I share the stories behind the scenes from your twelve most-liked 2016 pictures from The Gap Year Edit’s Instagram account. I got my feet wet taking this picture in May – the beach at Bamburgh, Northumberland. 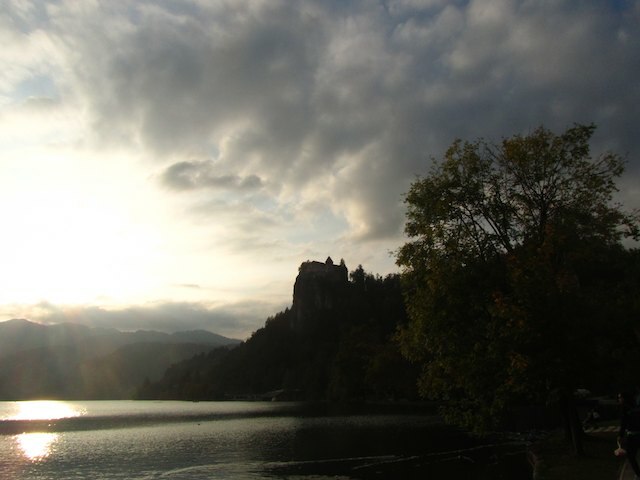 Miles and miles of sandy wonderfulness, with a medieval castle overseeing it all. Shhhh, don’t tell anyone about it! This picture from July was taken from the top of The Baltic arts centre, looking out over the banks of the River Tyne. Gateshead – and the iconic Sage Gateshead – sits on the left; the vibrant city of Newcastle on the right. The Sage opened in 2004 and is a celebrated concert and live music venue. I loved this pic, taken on a July city break to Berlin. It’s of Karl-Marx-Allee, the example of Berlin architecture that made me wonder if Communist-era apartment blocks could actually be the epitome of cool. I wrote about this and other cool Berlin buildings here. This rather fine specimen of a tree can be found in the grounds of Beningbrough Hall, a red-bricked Georgian mansion 9 miles north of York. Beningbrough makes for a rather fine day out from York by bike, as we discovered in June. Your 8th most liked photo was from my April visit to Fountains Abbey, a former Cisterian monastery located near Ripon in North Yorkshire. There are some rather lovely walks through the gardens, but it was the former abbey itself that got my attention: gotta love a bit of ecclesiastical symmetry! Another shot from Berlin – this time a rather fine view from the Victory Tower, aka the Siegessäule. Try saying that after a few beers! (Confession: I may have been drinking wine in one of the Tiergarten beer gardens before schlepping up the steps to the top of this tower and taking this photo). Sunset over Comala, Mexico – magic! Roseberry Topping, North Yorkshire, complete with a very keen runner! If you step on it, you can climb Roseberry Topping from car park to summit in nineteen minutes; as Andrew and I discovered in October. You will be knackered by the time you reach the summit, though! The reward all around is stupendous views: this one’s looking back up to Roseberry Topping from one of the many footpaths that criss-cross this northern-most part of the North Yorkshire Moors. Reflections ahoy in the Leeds-Liverpool Canal, which flows aside the former industrial mill town of Saltaire, near Bradford. The mills that thrived during the Victorian era and beyond are now home to offices and (on the opposite side of the canal out of shot) the wonderful Salts Mill, complete with David Hockney exhibits. We visited on a rather chilly March day. I had a lot of fun snapping pictures here, the undercroft of Fountains Abbey. Another shot from my April visit, it was quite a feat to capture this scene without hoards of visitors wandering through. There’s something magical about the North Yorkshire coast. Whitby’s old town, for example, looms under the shadow of a graveyard and a ruined Benedictine abbey, both inspiration for Bram Stoker’s “Dracula”. Dress up here in blood-drenched clothing on one of the twice-yearly Goth Weekends and no-one will bat an eyelid. Or, on a brisk March day, take photos looking back down the 199 steps (count ‘em) to the Abbey. Yes, Whitby again! The red-tinged daylight of golden hour, just before sunset, had Andrew and I running ‘round Whitby like demons (or Dracula!) possessed. This picture, taken at the bottom of the 199 steps up to the Abbey, captured the moment perfectly. There you have it. Why not have a read of last years’ favourites? Follow along on The Gap Year Edit’s Instagram for pictures of my mildly adventurous travels from both UK shores and further afield. Have you ever visited somewhere having only seen a photo? Did it live up to the pictures? Yes, it’s a really bad Christmas pun … the twelve days of pictures is here! Huuuge thanks to my fellow Instagrammers for the likes, comments and follows that made this post possible. If in return my piccies give you even the smidgenest amount of “Travel by Instagram” inspiration, I’ll be – as we say in Yorkshire – well chuffed. 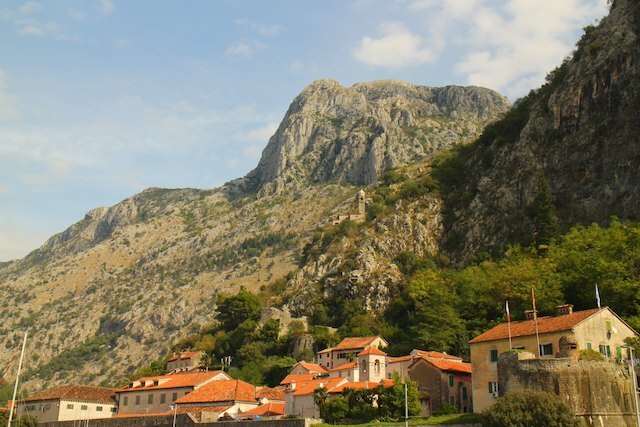 The walled city of Kotor looks out onto a fjord-esque expanse of water, and up to the mountains. It’s special. This pic was taken in October in a post-marmalade croissant breakfast state of satisfaction, perched with my feet dangling over the harbour wall. 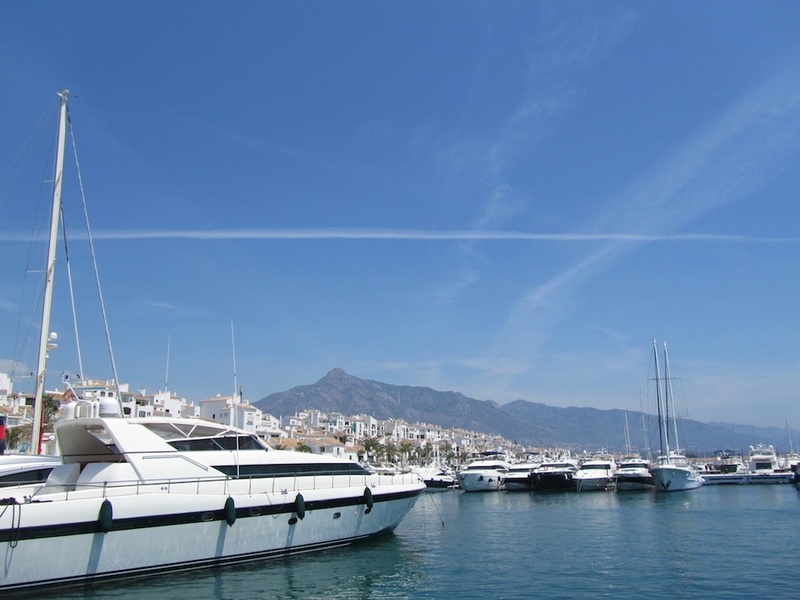 Budva’s old town – its redeeming feature! 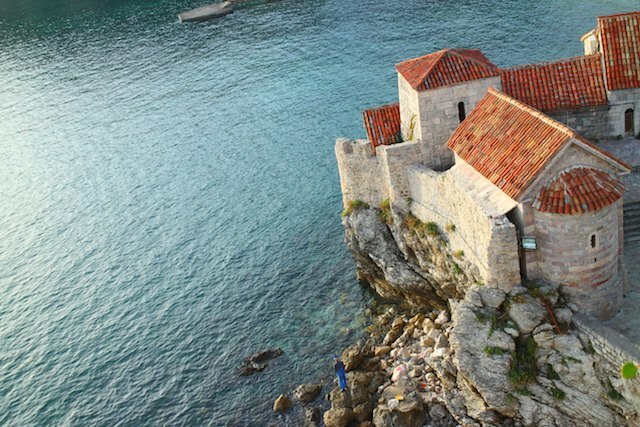 My October walk from the gorgeous island of Sveti Stefan (a couple of miles south) ended in Budva. Budva’s home to a rather ugly stretch of built-up coastline, but redeems itself somewhat through its old town, pictured here. I preferred Kotor, though! 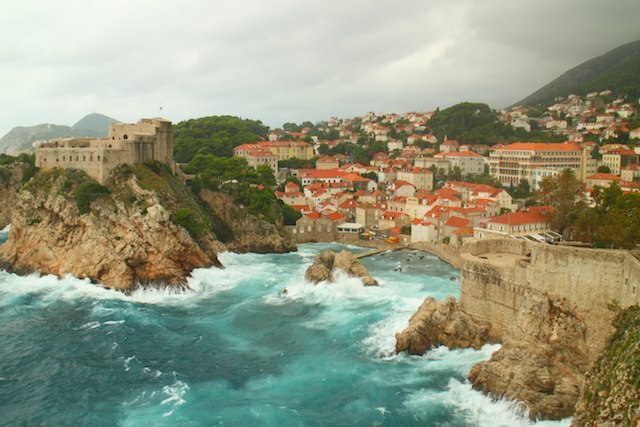 It was a tad blustery in Dubrovnik during my October visit! A blustery walk around Dubrovnik’s city walls gave more dramatic photo opportunities than you could shake a stick at, and gave me a very bad hair day. Frothy-topped waves pounded against the rocks and walls that protect this proud city during my visit there in October 2015. I posted this pic in the wake of the Paris attacks, although Paris is sadly only one of many tragic stories of human atrocity in 2015. Kenya, Nigeria, Iraq … countries where 100s have been murdered or kidnapped without the same level of Western outrage and media attention. 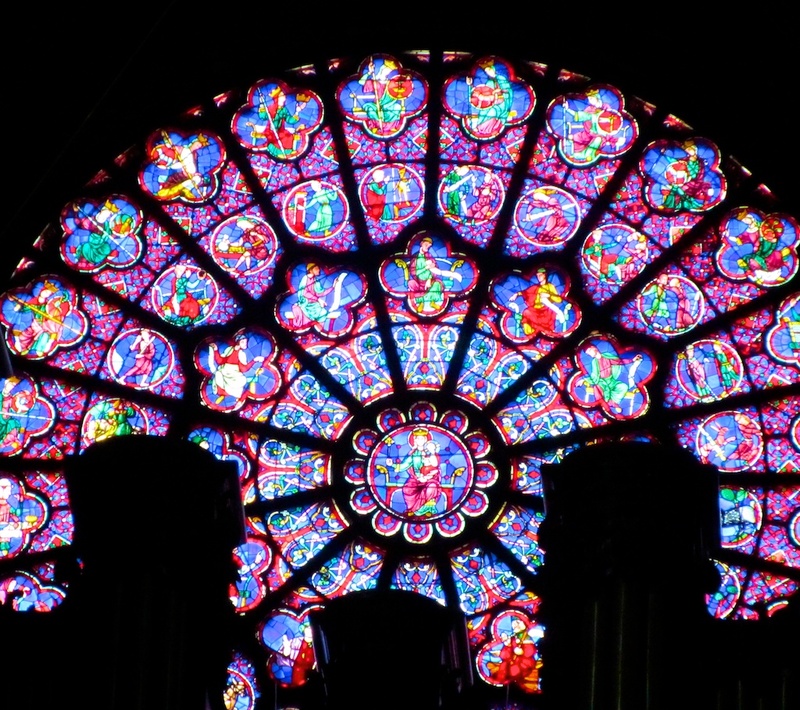 I took this pic back in February 2011, when I spent a couple of wonderful solo days in Paris after a work conference. 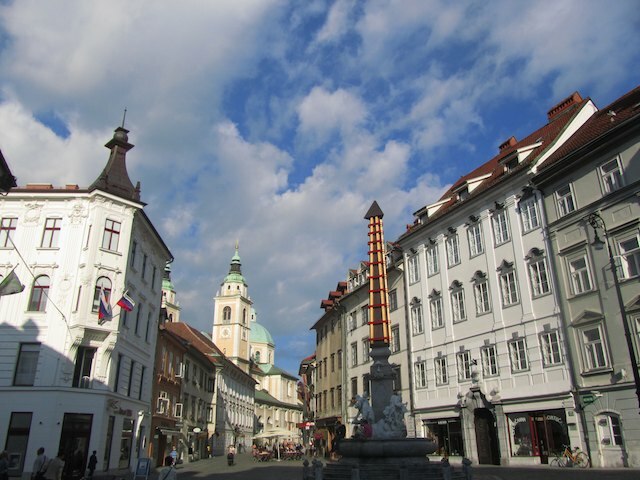 Ljubljana, you’re so pretty! One of Europe’s most underrated and difficult to spell capital cities is home to Viennese architecture, some very fine (rarely exported) wines, café culture and a rather fine castle with a nicely flirty calligraphy-writer. It’s the type of place you could take your mum – even mine, who has never set foot outside UK shores. I visited in October 2014. I adore Islamic architecture. Tiles, geometric patterns, colourful tiles, symmetrical water features, cool patios: I am a huge fan, or – as they say in Spain – an aficionado. The architectural legacy of the Moors in Andalucia, Southern Spain, has long drawn me, and I captured this shot on my second visit to the Alhambra in June 2010. 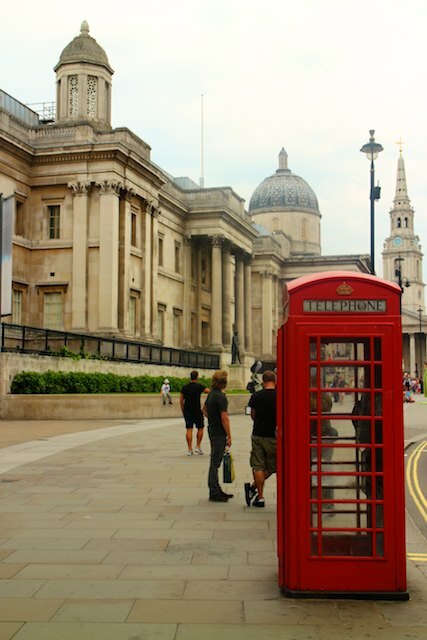 I’m not sure if it was the stereotypical scene of British dual icons the red telephone box and the National Gallery which made this picture so popular, but popular it was! It was taken on a culture vulture girls’ weekend in August with my oldest school friend, just before a major downpour! Placa Street at sunset. Sigh. 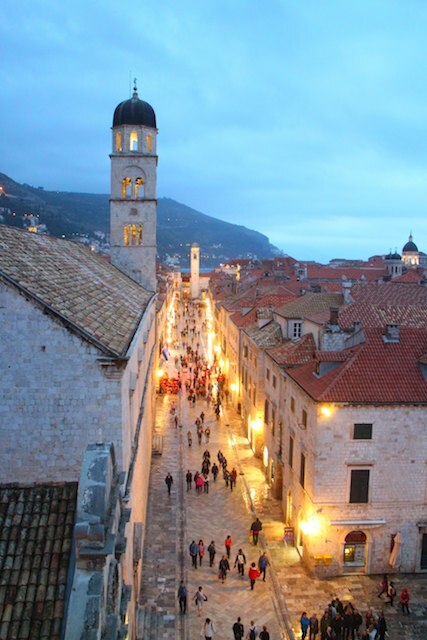 The October sunset view from the city walls into Dubrovnik’s Placa Street was as dramatic as it was perfect. The wide thoroughfare is a stunning spectacle, albeit one that’s manicured to within an inch of its life, or, as my boyfriend put it,“like Disney”. I loved the time I spent in Dubrovnik, but was happy to ditch its glossy magazine qualities for somewhere (aka Split) that felt more real. It still makes for a good photo, though! Confession: I didn’t rate the Acropolis. I know, sacrilege. 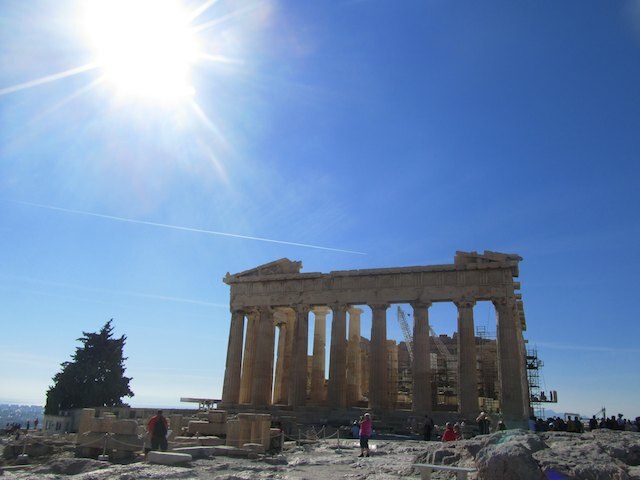 I did, however, adore Athens – bustle, food, arts scene and all. Weird, as I’d expected to spend many happy hours at its most famous landmark, and to feel a bit “meh” about the rest of the city. The Acropolis. Half-decent picture, but I didn’t love this Greek icon. What can I say? It was heaving – even on a Tuesday afternoon in late October 2014, overwhelmed by scaffolding, and its neighbouring namesake museum was – in my view – far more interesting. Yup, call the culture police on me. Lake Bled is an hour or so on the bus from Ljubljana, a journey I spent chatting to fellow Brit and photographer Simon, who happened to have the seat next to mine. We wandered around Bled Castle, drank copious amounts of coffee, sampled the famous Bled cake (delish) and took a lot of pictures. This one was an impromptu snap in the late afternoon as we were dashing for our bus. Baelo Claudia sits about 15 miles north of Tarifa, the southern-most point of mainland Spain, overlooking a dramatic beach. I left my fellow yogis (I was on a yoga holiday) on the beach in Conil de la Frontera to take a trip in my super-small hire car to visit this ancient Roman settlement. Stone columns, an amphitheatre, a paddle in the Mediterranean and some rather fine grilled sardines made it a top day out back in June 2012. I used Canon EOSM and Canon Powershot cameras to take the pics features here. The mirrorless EOSM has bags of features and it’s nice and compact. When I want something even more portable to “snap and go”, I use my trusty little Canon Powershot. The first few months of 2015 have been pretty eventful. I spent two months travelling in Nicaragua, lapping up its spirit and diversity. I negotiated countless chicken buses, and fended off several questions about my solo travel status. I found new contract and freelance work back in the UK. And I met someone I thought I’d connected with, only to see fate have other ideas. Overall, 2015 has given me a tonne of happy memories. Many are because I’ve achieved some of my 25 (more) things I’m going to experience before I die. I committed these to paper back in December, and – woo, yay and woo again – progress has been made! Nicaragua is home to 19 (count ‘em) volcanoes, so it would have been quite hard NOT to see any whilst I was there. Whilst visiting Volcán Masaya can be done pretty much by driving up to the crater – health and safety laws are a tad different in this part of the world; Volcán Telica near León gave me the chance to hike to the summit and peer into the bubbling lava in the crater below. Plus, those volcanoes make for some pretty dramatic sunsets. Sigh. Yup, that is the smoking crater. At Volcan Telica in Nicaragua. For more, read my post on visiting Nicaragua’s volcanoes without breaking (too much) of a sweat. Ok, so fluent would be a huuuuuugely stretching description of my Spanish language “talents”, but two weeks in language school, followed by independent travel in Nicaragua, helped enormously. At least I can now make a passable attempt at the past tense. Plus I had a drunken conversation in Spanish at 3am the other Sunday morning after a loooooot of vodka. That counts, right? Hemingway passed me by at school, so as part of my occasional, “I must read some modern classics” phase (DH Lawrence was a step too far), I decided Hemingway was a must. And what better place to buy a Hemingway novel than at his former home in Key West, on the Florida Keys? Let the reading extravaganza commence! I read the compelling and descriptively narrated, “The Old Man and the Sea” whilst watching the sunset over the Keys with a glass of wine. A general feeling of “this is the life” ensued. The “TV” tip, from a photographer guru, worked a treat on a trip to beautiful Bolton Abbey in Yorkshire, and I’ve been putting in into practice since. Lava, lingo, literature and light – achieving these four things from my “25 experiences” list has meant I’ve seen incredible sights, embraced a style of learning I usually shy away from, read something I wouldn’t usually have picked up (and loved it), and met some unforgettable people along the way. Embracing the “do-er” in me has not only given me those wonderful memories, but reinforced in me my famed sense of pride. What are you most proud of so far in 2015? Why did it make you feel that way?